An apt quote from a novel that does precisely that: trickles in and won’t let you go. 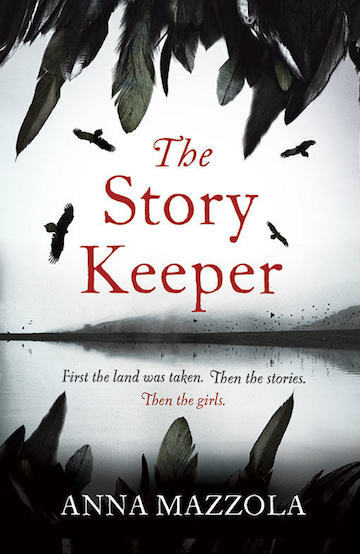 Anna Mazzola’s second novel The Story Keeper is inspired by the West Ham vanishings: the unexplained disappearance of a number of children and young adults from London’s East End in the 1880s and 1890s. However, don’t come to this book expecting gritty cobbles and grubby urchins – the urban mystery is simply a starting point from which Mazzola has woven a tapestry like tale layered with folklore and superstition and some very dark secrets. Rather than London, the setting for The Story Keeper is the dangerously beautiful Isle of Skye. This is a place rich with language, a centuries-old story-telling tradition and its own difficult history of cleared people and stolen lives. It is the perfect background for Mazzola’s dark fairy tale and becomes a powerful character in its own right. The novel, set in 1857, tells the story of Audrey Hart, a girl with her own shadows and secrets, who runs away from London to join the household of a reclusive folklorist and become a collector of stories herself. The community she attempts to engage with is suspicious of outsiders and thick with its own superstitions: when young girls start to disappear, the culprit is said to be the spirits of the restless dead who take on the form of birds. The mystery itself, and the fallout from its unravelling, would be engaging enough but Mazzola brings another dimension to the book by threading it through with traditional folk and fairy stories, including a rather remarkable one of her own invention. This takes the novel into sinister atmosphere-thick Gothic territory – creepy and compelling and altogether wonderful. I loved this book. I loved that it respected the traditions it draws on and that language, with all its nuance and complexities, is so much part of the story. Above all, however, what I loved was that, for all its dark fairy-tale aspect, The Story Keeper, is a deeply human exploration of love and loss in all their myriad forms. I can’t recommend it highly enough –it’s one for re-reading; a keeper. The Story Keeper is published by Tinder Press on 26 July 2018. Catherine Hokin’s novel, Blood and Roses, brings a new perspective to the story of Margaret of Anjou and her pivotal role in the Wars of the Roses. Catherine’s short stories have been published in magazines including Writers’ Forum, Mslexia and iScot and the forthcoming Scottish Arts Club Anthology. She blogs monthly for The History Girls.